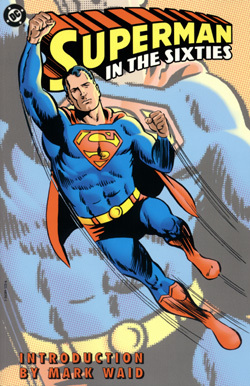 SUPERMAN IN THE SIXTIES IS NOW ON SALE! This FULL COLOR trade paperback presents 17 classic SILVER AGE stories from the 1960s! Superman, Superboy, Krypto, the Legion of Super-Heroes, Supergirl, Superbaby, Batman, Robin, Lois Lane, Jimmy Olsen, the Bizarros, and MANY MORE fun and exciting characters star in these FUN and ACTION PACKED adventures!! The Story of Superman's Life! 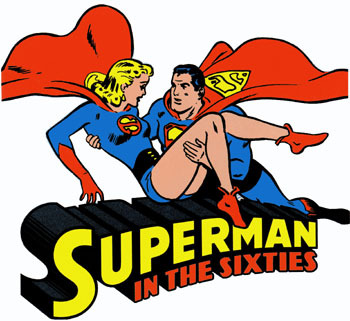 The Last Days of Ma and Pa Kent! The Showdown Between Luthor and Superman! Superman's Mission for President Kennedy! The Halloween Pranks of the Bizarro Supermen! The Romance of Superbaby and Baby Lois! The BIZARRO Invasion of EARTH! The Red-Headed BEATLE of 1000 B.C.! Best wishes from your friend SUPERMAN! How the SUPER-FAMILY came to EARTH from KRYPTON! The SECRETS of the FORTRESS OF SOLITUDE! Poster of the SUPER FAMILY! This book is currently on sale at your local comic-shop, or if you choose you can BUY IT ON-LINE!